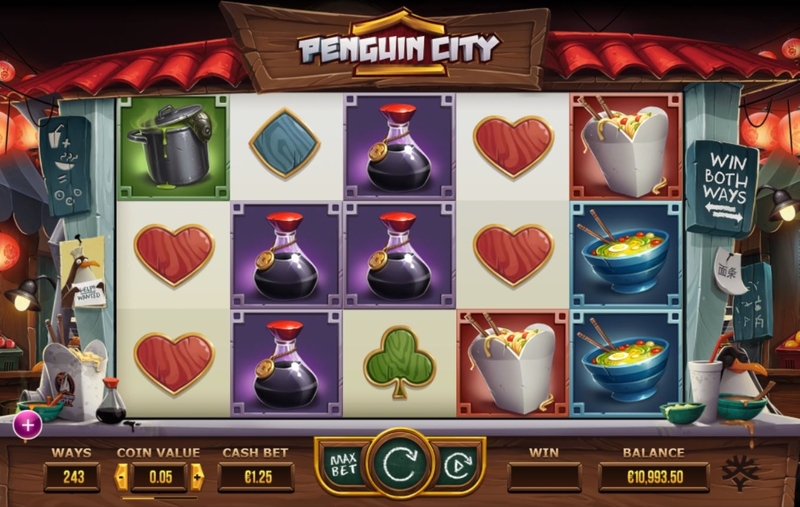 Penguin City slot is a bizarre game even by Yggdrasil's imaginative standards, where we see our flightless Antarctic friends mingled with Chinese foods such as Chow Mein and Soy Sauce on the reels. I hasten to add our dear Penguins don't appear to be amongst the ingredients of the said dishes - if they escape in time! A soothing Oriental music creates our soundtrack and chopping knives ring alarm bells for the penguins as the reels stop and they have every reason to squawk in alarm too, given the background is a Chinese kitchen and the poor squid is already cooking on the stove. 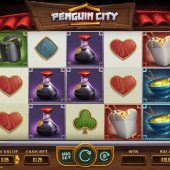 Will Penguin City have your bankroll in an equally perilous situation? Yggdrasil have been known to make some odd models consisting of 11 or 17 lines but here we get 243-ways as with their Legend of The Golden Monkey and Legend of The White Snake, but this time the wins pay both ways, from right-to-left too. You pay 25 coins for one spin and the picture pays range from 10x bet for a full way of 5 noodle cartons, 8x for the soy sauce down to 4x for the cleaver. You have the typical Yggdrasil pictorial card suits too as the low pays ranging from 70 coins down to 50 but not much else - there are no scatters and thus no triggered bonus round which is a shame, given what we shall discover about the in-play activity of these seemingly doomed Penguins. The game boasts a maximum pay of 1500x bet which I can only assume is due to the stacked icons on the reels and we don't even get many Wilds as they only appear singly on reels 2 and 4 in the base game. The only feature we get here is triggered randomly and is called 'Penguin Escape Mode'. There are a bunch of doomed Penguins queued up to the left of the reels, waiting to be pushed onto a conveyor belt and through the central trapdoor to their culinary doom at the hands of the cleaver wielding chef. Luckily for them (and us) they try and use a springboard to bounce over this gate to hell and then land on the reels. When this occurs they will either add a sticky Wild to an existing winning combination or if no win is present they will swap a symbol on reel 3 to create a win. You may also see during Escape Mode the stacked Emperor Penguin on reel 3 which will slide down one position until it disappears beneath the reels. Wow. This drivel goes on until a Penguin falls through the trapdoor which is usually within 3 escape attempts. You may be lucky enough to get a 'big' win of 20x bet or more via these sticky Wilds and even worse, each spin during the mode is paid for similar to Netent's Wishmaster feature.